With eight separate meters for d.c. voltage measurements. With three separate meters for d.c. voltage measurements. With eight separate meters for a.c. voltage measurements. Three separate ammeters for a.c. measurement. With three separate Ac voltmeter for voltage measurement. 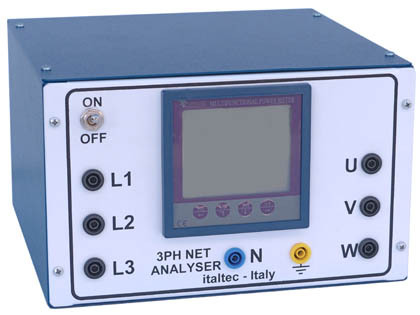 Two power meters can be independently used to measure single-phase or three-phase power when connected with ARON insertion. Max Voltage : 500V c.a. For speed measurements up to 5,000 rpm on continuous operation or 10,000 rpm on intermittent operation. Voltmeter, Ammeter a.c./d.c., Frequency meter. Digital meter with graphic display. Voltmeter: from 0 to 500V a.c./d.c. Ammeter: from 0 to 10A a.c./d.c.